For the past year, Philadelphia’s Benjamin Franklin Parkway, a vast and historic thoroughfare known for the museums and institutions that line its mile-long stretch, has celebrated its 100th anniversary. To tell the story of its inception and to help envision its future, cultural institutions and organizations on and off the Parkway organized a myriad of Parkway 100 exhibitions, events, community conversations, and promotions from September 8, 2017 through October 26, 2018. To commemorate the Parkway’s 100th anniversary, the Association for Public Art (aPA) presented two spectacular public art commissions – Cai Guo-Qiang’s Fireflies and Jennifer Steinkamp’s Winter Fountains – and released a special Museum Without Walls™: AUDIO program about the history of the Parkway and aPA’s role in its development. 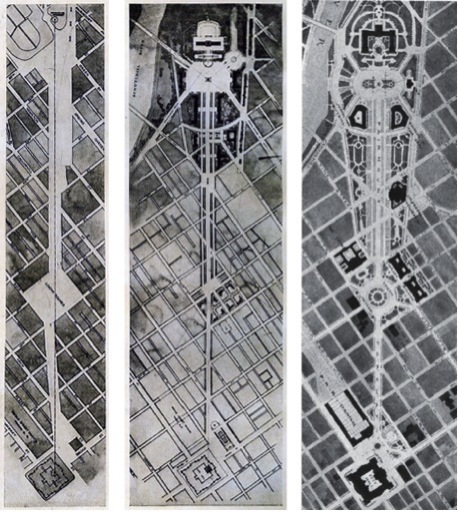 How did the Benjamin Franklin Parkway come to be? What makes the boulevard so significant? Discover the story of the Parkway and the Association for Public Art’s (formerly the Fairmount Park Art Association) involvement in this commemorative Museum Without Walls: AUDIO program, Parkway at 100: Dreams into Reality. The Art Association gathered a team of architectural experts – Horace Trumbauer, Clarence Zantzinger and his partners, and Paul Cret – who created a detailed parkway design that was added to the City Plan in 1909. Ground officially broke on the project in 1907, with the demolition of approximately 1300 properties that the city had acquired for the project. Construction on the Parkway did not begin until ten years later in 1917, when French landscape architect Jacques Gréber submitted a revised plan to the Commissioners of Fairmount Park. To learn more about the history of the Parkway and the Association for Public Art’s involvement, read The Benjamin Franklin Parkway: Philadelphia’s French Connection. Presented on the occasion of the Parkway centennial, Cai Guo-Qiang: Fireflies was a major site-specific work by internationally acclaimed artist Cai Guo-Qiang along the Benjamin Franklin Parkway. The project was commissioned by the Association for Public Art with Fung Collaboratives, with major support from The Pew Center for Arts & Heritage. 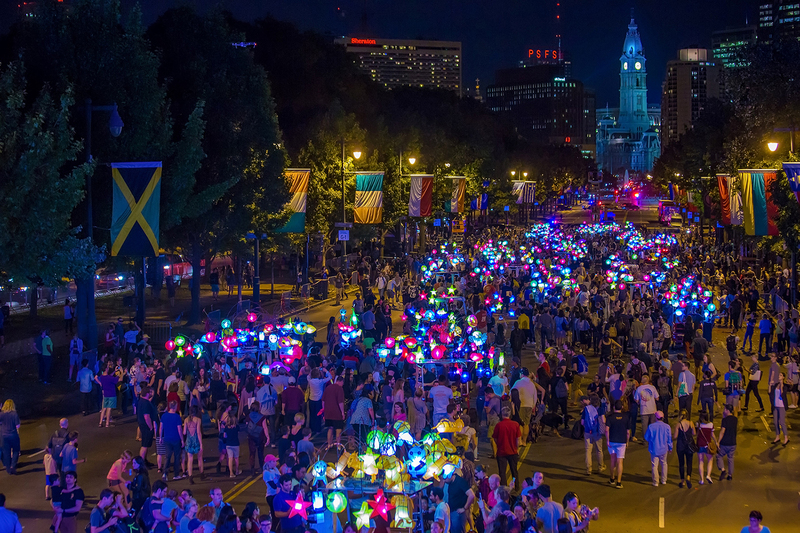 Fireflies invited the public to actively experience the Parkway as a nocturnal dreamscape conjured from the languorous movements of hundreds of illuminated handcrafted Chinese lanterns in a bevy of colors and shapes, held aloft by a fleet of 27 pedicabs that the public could take free rides in. Approximately 2,800 people gathered for the World Premiere opening celebration (pictured), and some 5,500 more took free moon-lit rides along the Parkway throughout the project. Jennifer Steinkamp’s mesmerizing Winter Fountains served as a centerpiece for Parkway 100, illuminating and welcoming people to the Parkway at night. The project was presented by the Parkway Council and commissioned by the Association for Public Art, with major support from the William Penn Foundation. 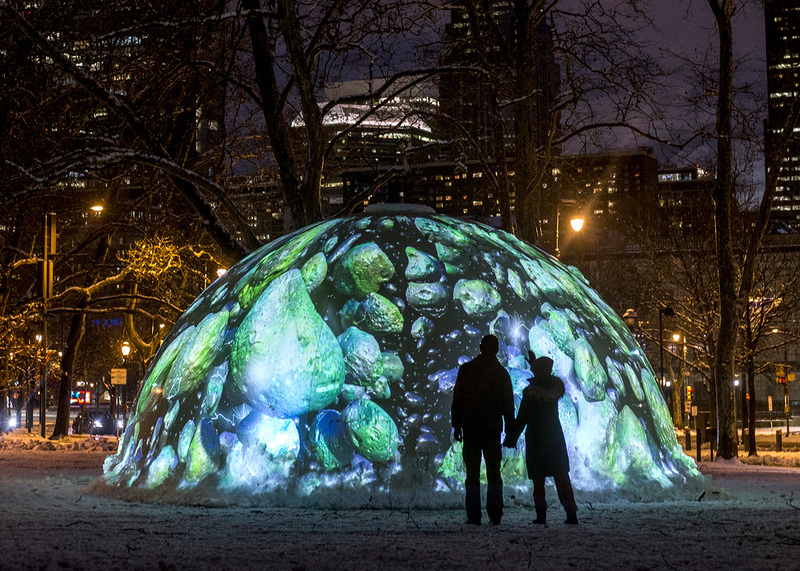 Inspired by the Parkway’s signature fountains, four 13ft-high and 26ft-wide architectural domes – metaphorical winter fountains – glowed along the Parkway with Steinkamp’s phantasmagoric and dream-like animated video projections. The digital animations were projected onto the surface of each dome in distinct hues – cool green or blue, or warm pink or yellow. A celebration of scientific inquiry, the imagery reimagined the formation of electricity in clouds, inspired by Benjamin Franklin’s research and evoking the art and science explorations represented by the Parkway institutions. The Benjamin Franklin Parkway’s renowned public art collection visually parallels the history of American sculpture. 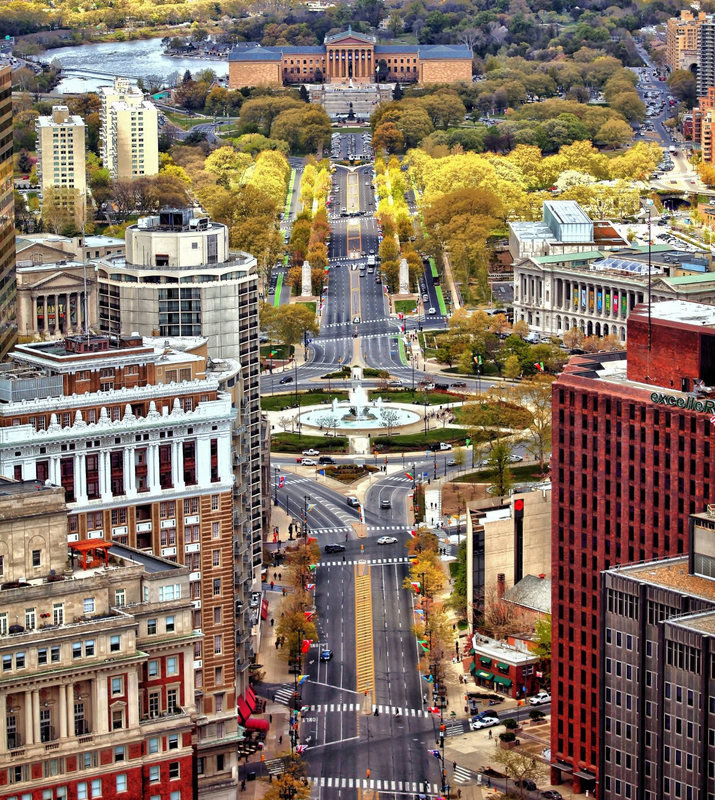 Running from the heart of Center City at City Hall to Fairmount Park at the Philadelphia Museum of Art, the Parkway has steadily evolved since the early 20th century as the city’s cultural mecca of art museums, educational institutions, and public artworks. As strong supporters of the “City Beautiful” movement, the Association for Public Art (aPA) – which commissions, preserves, interprets, and promotes public art in Philadelphia – has continued to advocate for good civic design and the commissioning and placement of outdoor sculpture along the Parkway, including Shakespeare Memorial in front of the Free Library, and the acquisition and installation of The Lion Fighter and The Mounted Amazon at the base of the Philadelphia Museum of Art steps. More recently, aPA installed Mark di Suvero’s Iroquois and Roxy Paine’s Symbiosis at 25th and the Parkway, as well as Barbara Hepworth’s Rock Form (Porthcurno) at 17th and the Parkway, where the sculpture joins Alexander Calder’s Three Discs, One Lacking and Henry Moore’s Three Way Piece Number 1: Points. 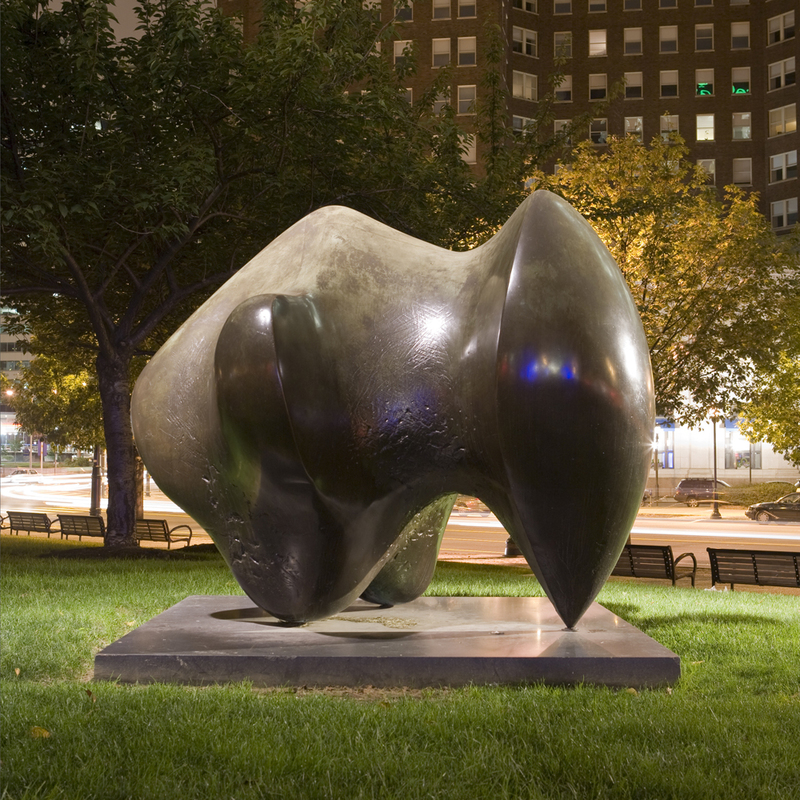 Philadelphia’s preeminent outdoor sculpture collection is one of the largest in the United States. Over the past decade, aPA worked with the Center City District to light and sign the impressive collection of outdoor sculptures along the Parkway, and in 2010 launched the Museum Without Walls™: AUDIO program to further interpret these artworks. To access information about the sculptures along the Parkway, Museum Without Walls™: AUDIO is available for free via phone, mobile app, and streaming audio on our website. A self-guided sculpture tour of the Parkway is also available here, which includes artworks such as Robert Indiana’s LOVE and AMOR, Alexander Stirling Calder’s Swann Memorial Fountain, Auguste Rodin’s The Thinker, and Rudolf Siemering’s Washington Monument.